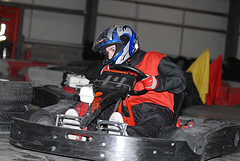 Redline Indoor Karting are located on the Cibyn Industrial Estate in Caernarfon, North Wales. The local train station is in Bangor (9 miles / 14 km ) and the nearest airports are at Liverpool (85miles / 96km) and Manchester (96miles / 154km). We are also only 29 miles / 46km from Holyhead Ferry Terminal which links mainland Britain to the Republic of Ireland. There are two main road routes - the A55 and the A470. Both of these link to the A487 which is the main road through Caernarfon. The A55 travels along the North Wales coast to Bangor before crossing the Menai Strait and onwards to Holyhead. Take the exit at Junction 9 - this is signposted for ''Bangor, Caernarfon and Ysbyty Gwynedd Hospital'' and is the junction next to Britannia Bridge on the mainland side. From here you can pick up signs for the A487 to Caernarfon. The A470 is a primary route from South Wales and passes from Cardiff to LLandudno. The A487 joins the A470 near Gellilydan (between Trawsfynydd and Ffestiniog) and continues through Porthmadog to Caernarfon and Bangor. Follow the A487 towards Caernarfon. Once you have entered the town follow the signs for the A4086 to Llanberis, you will soon pick up signs for the Cibyn Industrial Estate which is on the right as you leave Caernarfon on the A4086. Once on the estate follow the road until you reach a T Junction. Turn left at the T junction, we are located on the right at the brow ofthe hill. Alternatively please click here to view our online map.